Everyone can face a problem, such as a trouble sleeping at some point in his life. You are tired after a hard working day, go to bed, and then the most interesting part begins ... you do not fall asleep because your mind is full of various thoughts and worries. How's that possible? How can you help yourself to fall asleep and get rid of this stream of thoughts in your head? Unfortunately, not all people can switch off their minds if they want it. It looks like some sort of superpower. However, you can get this superpower and help yourself go into sleep mode when you can not fall asleep. In our article, you will find a list of 6 effective techniques that help relax the mind and invite sleep. You can do them during the day to help with stress, or just before going to bed. Sweet dreams, guys! This is the easiest and most effective way to free your mind from various thoughts and worries and to fall asleep quickly. If you can’t sleep, you can listen to a meditation video or audio track. Just close your eyes and listen to the calming instructions. You can find a wide selection of such videos and audio tracks on YouTube, simply choose what you like best and enjoy a sound sleep. Practicing this technique you will focus on your body by tensing and releasing your muscles, and you will learn what a relaxed state feels like. Thus, you will be distracted from an unnecessary stream of thoughts and get the desired night dream. This technique is the basis of almost any meditation. Practicing deep breathing will help you relax your muscles, slow your heart rate down, and slow down your breathing. And most importantly, this technique takes your attention away from worrying thoughts. Practice this technique lying in bed for as long as you like to get a sound sleep. Place one hand on your stomach and one on your chest. Just see which hand is rising, and pay attention to it. Breathe in slowly through your nose for the count of 4 seconds. Try to breathe in such a way that the hand on your stomach rises, and the hand on your chest only rises a little. Once you breathe in, hold your breath for 4 seconds, and then breathe out through your mouth for 4 seconds. You probably already heard about this popular method of breathing. Doing this technique, you just need to breathe in for 4 seconds, hold for 7, and exhale for 8. Practicing this technique before going to bed, you will definitely get the desired and sound sleep. Mindfulness exercises work by focusing your awareness in the moment. 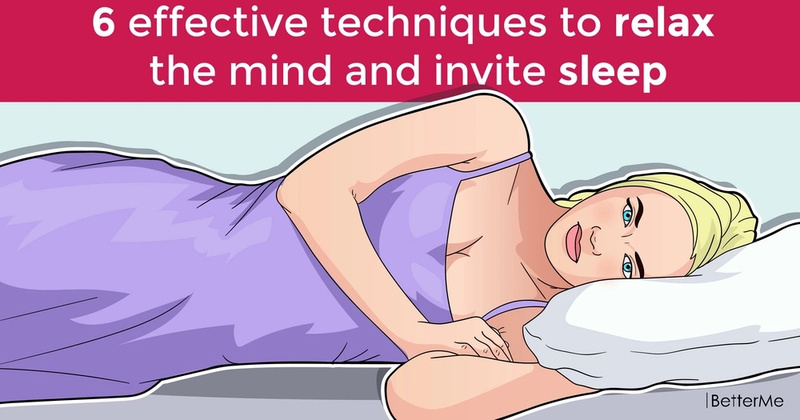 So if you have trouble sleeping, and when you lie in bed your mind is overwhelmed with various thoughts, this practice will definitely help you. In addition, practicing mindfulness exercises on a regular basis, you will also learn how to cope with the stress and anxiety. If you cannot sleep, you just need to get up for a while (if you don’t fall asleep within 30 minutes, it’s sometimes helpful to get up for 10 minutes). We do not recommend watching horror films before bed. -If noise keeps you awake, do not let it stress you out. Simply find a way to stop it or reduce it. You can also try some aromatherapy before going to bed.